When my brother and I were little, we had our own country. It was called Bouse, and it was top secret, so don’t tell anybody about it. Bouse was shaped like our dog, Tessie (her eye was a lake.) All of the animals in Bouse could talk, and they were all very friendly and happy–we had feasts and dances and plays. There were no people, no cars, no factories on Bouse, but in neighboring Karnland, there were only cars, or everybody was part car, I can’t remember, and they were enemies of Bousishians. All animals go to Bouse when they die, and some kind humans do as well.I speak lightly of Bouse, but it was incredibly important to me growing up, and in many ways remains so to this day. It was formed by who we were and what we believed, and it informed our beliefs and our behavior as well. Now my boys have a world of their own. It’s called World Tenn, and the world is made like a giant tennis racket with water inside, and everybody has shoes made out of tennis balls. My boys have different names there, and they have sisters and a baby brother and a dog who can fly. At first I was charmed by the stories, they’re delightful and inventive, but lately it’s starting to feel more serious for them, and I can’t account for how happy this makes me. Yesterday Malcolm and I took a walk after dinner. Malcolm is fun to ramble through the woods with, except that he always has to have a stick, and he always has to hit things with it. He smashes trees, he slices through weeds and tall grass. We’ve told him a million times not to, that it’s better to leave everything as you find it, that he might be destroying the homes of animals, birds, or insects. But he did it anyway. Yesterday he told me that he’s not going to do it anymore. “Why is that?” I asked. It turns out that it goes against the prevalent morality of World Tenn. The enemy of World Tenn is a king that hates mother nature and spends all of his time trying to destroy plants and animals. My boys have the job of protecting nature. Ack! It just kills me that they share a world forged in the fiery furnaces of their imagination and their affection for each other. And they’ve invented a moral code that they need to live up to. They’ve made their own political philosophy, their own religion, just like my brother and I did. Like all good religions it contains myths and far-fetched stories, it borrows from older tales and legends, it contains strife and violence, it reassures them with an afterlife, and it suggests a way to behave in harmony with the creatures of the actual world around them. There are portals into World Tenn–one is a beautiful winding path that branches off from the secret passage on the other side of the other side of the canal. This morning Malcolm told me that there’s one on the roof outside of his window, because a squirrel sat there for a long time, and didn’t seem scared of Malcolm watching him. Of course the real doors into their world are in their minds, and they can take that with them wherever they go. Whatever they do, they have the comfort and strength of their creativity, of their love for each other as brothers, of their lives as heroes, of a world all their own. And nobody can take that away from them. 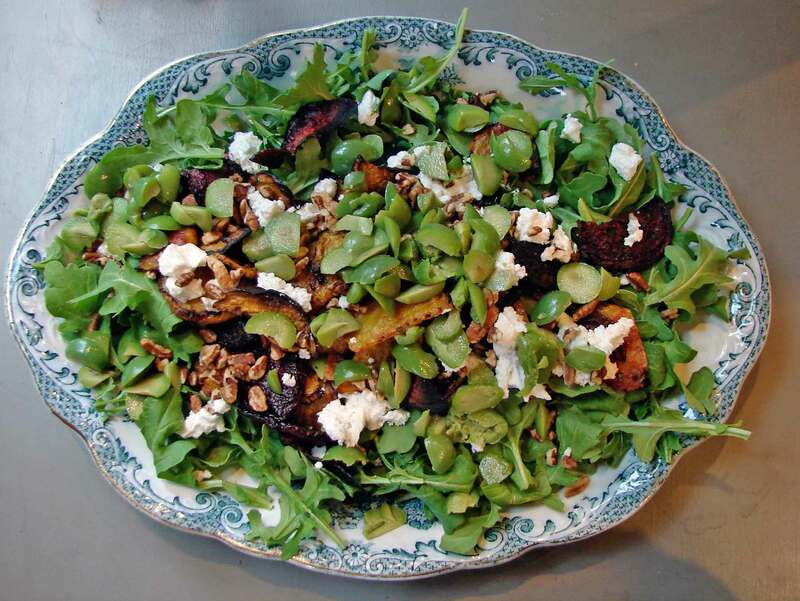 When I made this sort of warm salad of arugula, roasted beets, farro, goat cheese and pecans, I kept the farro separate. I thought it might be the only part of the salad the boys would eat. Silly me! They gobbled down the beets, goat cheese and pecans, and didn’t have much interest in the farro! So you could serve this with the farro as a layer below the arugula, or you could mix it right in with the arugula if you liked. We ate this with tiny new potatoes, boiled and tossed with butter, salt and pepper, and I recommend this. It’s a serving suggestion!! Preheat the oven to 425. Slice the beets in half top to bottom, and then into quarter-inch half moons. Coat these with olive oil and balsamic (it’s easiest just to use your hands to gently toss them!) and then spread them in an even layer on one or two baking sheets. Roast until they’re browned on the edges, turning from time to time. It should take about 20 minutes. Meanwhile, pile the arugula on a pretty plate. Layer the warm beets right on top, spread the olives over the beets, sprinkle goat cheese and pecans over, and season with salt and plenty of freshly ground pepper. If you want to make the farro a layer in the salad, you can put it above or below the arugula, or mix it right in with the arugula. If the farro is warm it will wilt the arugula slightly, which is always nice. Process the pecans and garlic in a blender or food processor. Add the bread with its soaking water, the rosemary and the smoked paprika. Blend until very smooth. Add the balsamic and enough warm water to make the sauce as smooth and thin as heavy cream. Taste for salt and pepper. You can add more balsamic if you want some zing, or a drizzle of honey to add a touch of sweetness. In a medium saucepan over medium heat, warm 1 T olive oil. Add the shallot, garlic and bay leaves, and cook for about a minute, until the garlic starts to brown. Add the thyme, rosemary and oregano. Add the farro. Stir and fry for three or four minutes, until everything is toasty and sizzling. Add the water, stir well. Bring to a boil. Turn heat to low, cover the pan, and let simmer for about 20 – 25 minutes, until the water is gone and the grains are tender. Turn off the heat, and let the pot sit on the burner for another ten minutes or so. Stir in the salt, pepper, butter and balsamic. 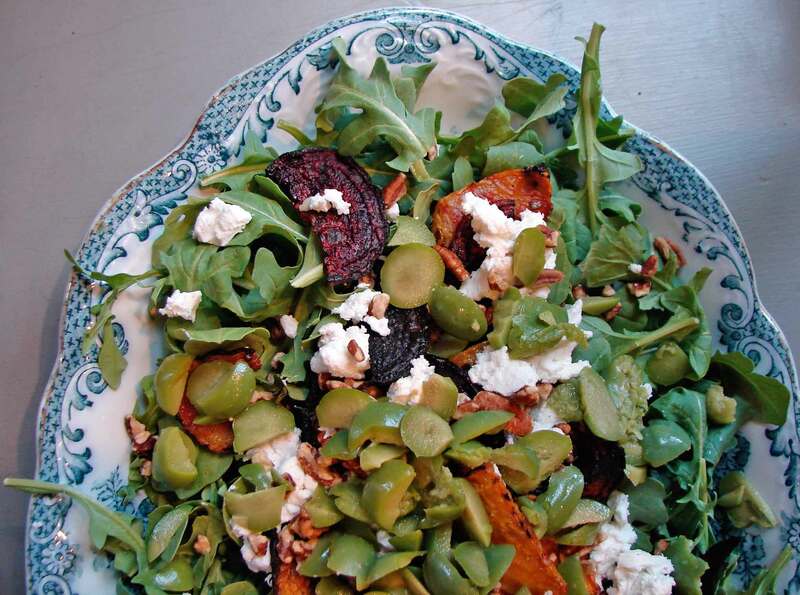 This entry was posted in potatoes, recipe, salad, sauce, Uncategorized and tagged farro, golden beets, grain salad, pecan tarator sauce, roasted beets by Claire. Bookmark the permalink. Sounds de-lish. Does the rosemary sauce get drizzled over everything or does it just go over the arugula? Oh! I forgot to say that, didn’t I? I served it on the side–I tend to serve everything separately because I never know what the boys will refuse to eat. BUt I think it would be nice drizzled over everything.